Master Wood Carvers is managed by a team that includes veterans with over 40 years' experience in the wood industry. We Guarantee satisfaction and will replace any defective product within one year of purchase. 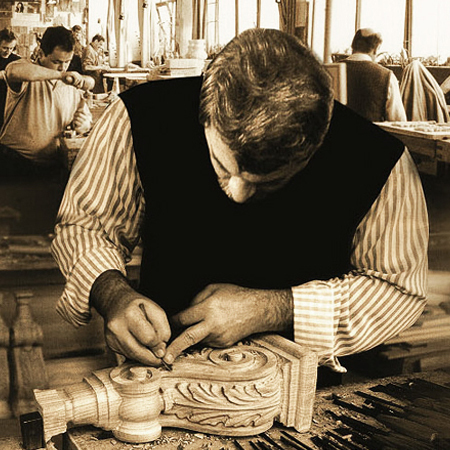 Unlike other carving companies, all our carving is done by hand. An art handed down from one generation to the next. CNC machines cannot match the skill of our master wood craftsmen. With over 500 carvers we are capable of carving any design required. Custom carved products in our specialty. Just send us a detail of the product and we will be happy to provide you with a custom quote quickly. Hand Carved products are our only Business. We do not sell light fixtures or chairs or non-related products. Our focus is strictly on custom architectural products to beautify your home or work place. We invite you to browse the Master Wood Carvers site to acquaint you with the different hand carved wood carvings that we created to enhance the decor of your home. All returns other than defective product must be returned within 30 days of receipt and free of damage. Returns may be subject to a 20% re-stocking fee. An authorization number (RTA) should be requested on our "Contact Us" form. We specialize in Custom Wood Carvings. You won't find lower prices anywhere else with the quality of work we do. Master Wood Carvers has over 40 years of experience in the wood carving and wood working industry. We offer exceptional quality on all of our hand carved wood carving and architectural home details. Hand carved in European tradition, we specialize in exceptional custom hand carved pieces. With over 500 carvers we are capable of carving any design required. All of our custom wood carvings are made from quality, long lasting premium woods. We can carve in Oak, Maple and Cherry Woods and now in Rubberwood. If you're looking for a specific size or even a corbel you found and have a picture as a guide when carving for you. Contact us today for a free quote on your unique custom carving. While you're here, you can also check out our How To Series on how to install some of our custom wood carvings. The series includes how to install corbels, fireplace mantels, capitals, onlays and crown moldings.